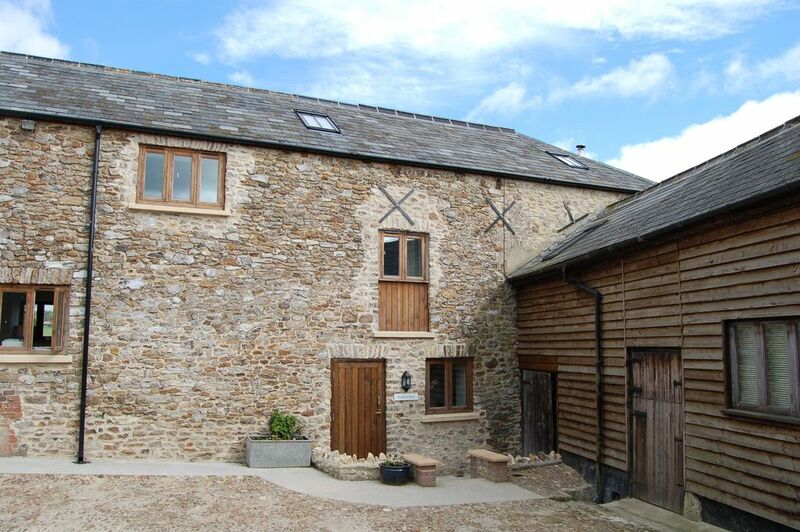 The barn comfortably sleeps 6 with room for 2 more. It has been awarded a 4 Star grading by Visit England. There is a large orchard 50 meters from the barn where you can relax, enjoy stunning views or have an early evening BBQ. The accommodation comprises a large sitting room on the top floor, an open plan kitchen, dining and sitting area (with cosy wood burner) located on the ground floor. There are three bedrooms including one bedroom that can be made-up as either a double or twin room. facilities continued: There are two separate bath/shower rooms as well as a ground floor cloakroom with WC. Location: The self-contained barn conversion is quietly situated in the farm courtyard adjoining a large farmhouse where the owners` family offer bed & breakfast accommodation. The farm is located just a couple of miles outside of the bustling East Devon market town of Honiton, with easy access to the stunning Jurassic coast about 15 miles away. Although quietly tucked away from main roads the farm is easy to access by car and perfect for those wishing to explore the local area`s many attractions. Walkers and cyclists are also very welcome and the house includes lots of information about footpaths and local routes. There are extensive walks through 150 acres of farmland, including 16 acres of ancient woodlands to explore, and the River Lupp which adjoins the farm. There is an excellent local walk to the Dumpdon Hill Fort, which is a National Trust Iron Age fort. Central heating and seasonal logs for wood burner included. Bed linen and towels included. Please bring own beach towels. Travel cot, high chair and a safety gate available on request - please note that there is limited space for a travel cot in the bedrooms. Please confirm if twin or double bed required in bedroom 2 when booking. Sofa beds available in third floor lounge at a supplement of £75.00 per person per week to allow a maximum occupancy of 8 guests - please enquire before booking. Wireless internet access provided. Good base for exploring Somerset, Devon and Dorset. The position of the property, away from the centre of Honiton but close to the A30 and the A35, was excellent for travelling to attractions in Somerset, Devon and Dorset. We were able to have days out at Lyme Regis and Exmouth, as well as going further afield to Minehead, without it being too long a day. We appreciated the welcome tea tray with bread, butter, jam and milk, and the pretty flowers in the rooms. The accommodation was well-heated, the beds were very comfortable. Lots of information leaflets are provided, and many fabulous books to dip into in a quiet moment, and some games for younger children. However, there was little in the way of entertainment for older children and adults. There are two televisions, and the top room is a fabulous place for a TV room, but the sofa beds weren't comfortable when used as sofas. The dining table is good and large, though, and we'd brought plenty of our own board games and card games. Located in the midst of farmland, it was quiet, despite also being the location for a number of business premises. There was a short but steep walk up to the triangulation point at Dumpdon Hill (National Trust), but other than that we were very disappointed that there were no walking routes in the '200 acres of parkland', as in reality this comprised fenced-off fields of cows. The property has free run of the orchard, about 100 steps from the front door across a sloping cobbled yard rather than a small private garden or patio. However, the fabulous view of the owners' flower garden from the kitchen window was very pleasant. Group of friends including 2 babies stayed at the Orchard barn to attend a wedding in Honiton. We had a lovely stay the house was a great size with lots of kitchen equipment so we could cook in the evenings when babies were asleep. Fiona and Greg were very helpful and answered any queries we had efficiently. The surrounding areas are stunning and we would highly recommend staying here. Thank you again for a wonderful experience. A great place as a holiday home. II did all it said it would on the tin. The accommodation details were accurate and any issue with kitchen equipment was swiftly dealt with by the proprietors. The kitchen/dining area was spacious with enough room for 6/8 to sit for communal meals. The bedrooms were spacious and despite having an infant there was space to spare in the master bedroom for him as well. The upstairs living room was in the eaves but there was plenty of space for the evenings and a large ish TV to watch the Olympics using the Freeview box! The property was spotless on arrival. The parking spaces for the property are a short walk but drop off of bags at the entrance was no problem. There is a lovely BBQ area in the orchard for Orchard Barn use (about 40 metres from the front door) overlooking the valley. Plenty of walks up Dumpdon Hill and a good spot to tour to the coast. We would recommend the Seaton Tramway and Lyme Regis for visits. Great Stay at a lovely located property. Set in a quiet location, we found this to be a great choice for our family to explore the region. We arrived to find a well equipped property with everything we need. The log burner in the open kitchen diner was a great feature and meant we didn't really stray upstairs (and lit it , even though it wasn't cold!) Greg and Fiona were on hand offering advice on things to do and see, which was a big help. Would highly recommend! Review of short family break at Orchard Barn. We are a family of four who shared our stay with friends (another family of four) and a dog. We found Orchard Barn to be a well maintained and welcoming property; the welcome pack of local bread and homemade jam was much appreciated as was the unfussy attitude towards the dog. The layout of the barn worked really well for our two families... two bathrooms and a downstairs cloakroom were much appreciated. The bedrooms were nicely laid out with plenty of wardrobe space. The loft room was great as a safe entertainment area for the children and doubled up as an extra bedroom for one child. Ideal for exploring the area; interesting local walks and within easy distance of the coast. Would definitely consider another visit. Many thanks for your review it is much appreciated . Schön und funktionell eingerichtetes Ferienhaus, welches kaum Wünsche offen lässt. •	Orchard Barn at Woodhayes Farm is just 1.2 miles north of the famous market town and antiques centre of Honiton and located in the Blackdown Hills, an area of outstanding natural beauty (AONB). •	Although quietly tucked away from main roads the farm is easy to access by car, 1.5 miles from the main A30 and 20 minutes drive from M5, making Orchard Barn the ideal base to visit Dorset, Somerset and Devon. •	We have easy access to the coast and are 10 -15 miles from the nearest beaches at Beer, Branscombe, Sidmouth, Seaton, Lyme Regis and the Jurassic coast. •	Exeter airport is just 15 minutes away by car and the city centres of Exeter and Taunton are 20 minutes by car.